Duck prosciutto (or goose prosciutto) is an old Italian tradition that originated, as best I can tell, in the country’s Jewish community, for whom regular pork prosciutto was forbidden. Some recipes, especially those around Venice and Friuli, cure the leg and thigh of large geese, while others stick to the breast meat. Either way, the result, when done right, creates a dark, rich, almost funky cut of meat that really stands out on a charcuterie plate. Slice it as thin as you can on the diagonal and serve it with melon, figs, good cheese, on top of a fried egg, with bruschetta — you get the point. 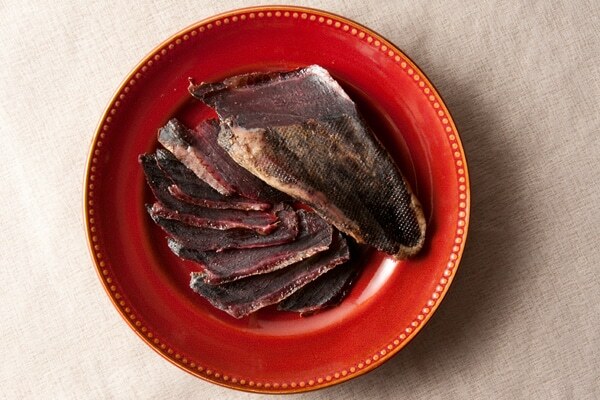 And the best thing about duck prosciutto? 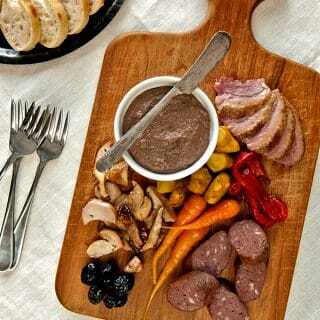 It’s probably the easiest charcuterie project you can undertake. It is where you should start if you are a beginner. Hunters, take note: Most wild ducks are too small to do this justice. But mallards, canvasbacks, redheads and pintails work, and I find that Canada and specklebelly geese work even better. 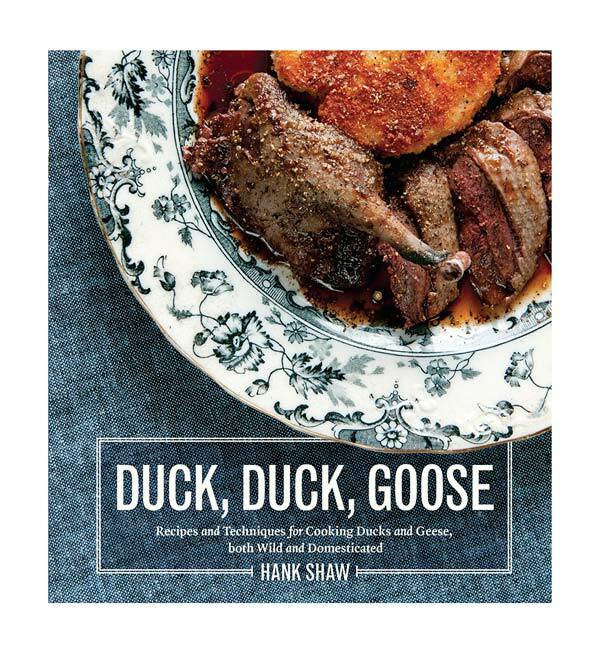 Non-hunters, buy breasts from Muscovy or moulard ducks, or use goose breasts. I do not wrap my duck prosciutto in cheesecloth for hanging, as many do. Some people prefer this because they say it helps keep the meat moist. I prefer to achieve this through proper humidity control. If you plan on hanging your duck for only a few weeks, go ahead and use cheesecloth, as it makes the breast easier to hang. There is another reason I skip the cheesecloth for long hanging: Mold. Mold can grow on meat whether it’s wrapped or not, but when it is wrapped, you can’t see it until the mold has grown substantially. White mold is good, black mold means you need to toss the meat. Green mold you should wipe away with salt water. You will see I have a very spare cure for my duck prosciutto. Just salt, sugar and some thyme. You can add other spices if you want, as I used to. But the more you make duck prosciutto, the more you want it pure, without the interference of so many spices. Why bother with a long hang time? Because the longer meat hangs, the more complex it gets: Think about the difference between a nice rosé and Barolo that’s been aging for a generation. I can tell in a bite whether someone’s charcuterie has hung for a long time, or for just the bare minimum. There is a beguiling funk to well-aged charcuterie that cannot be rushed. The more you eat cured meats, the more you crave that flavor. I cure my longest duck prosciutto for two months by starting the drying in 85 to 90 percent humidity, then ratcheting it down 5 percent a week each week until I get down to 65 percent, then I hold it there. I can hang it this way for a few more weeks, but there is such a thing as too long — you are making charcuterie here, not jerky, so the meat should retain some moisture. 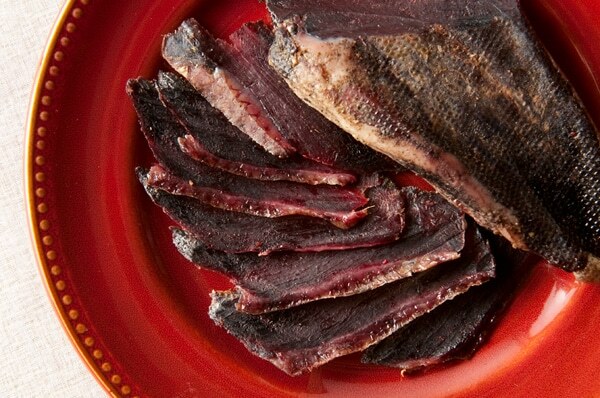 What happens if you inadvertently make duck jerky from your prosciutto? All is not lost. If you really can’t slice it super-thin because it’s hardened too much, chop it into small dice and add it to a long-simmering stew. The prosciutto will soften and you’ll appreciate it’s chewy texture in the stew. Once your duck prosciutto is ready, you can eat it straight away or wrap it and store it in the fridge for a few months. It will continue to dry out in the fridge, however. It also freezes well for a year or more. 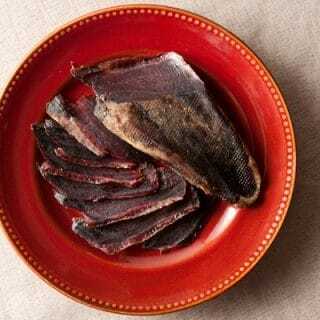 Duck ham, or duck prosciutto, can be dried for just a week or two, or for up to two or even three months. Start with a shorter cure until you get the hang of it, and eventually you will find the hang time you like. Start with the simple cure I have here, and add spices or herbs in future batches, if you so desire. First a note on the meat. When you breast out the bird, leave as much skin and fat on it as possible; you'll get these "tails" of skin on both the tail and neck end of the bird if you do, and this is what you want: They will come in handy later. If you haven't already, peel off the "tender" on the meat side of the breast. Deep-fry in batter and enjoy! Weigh your duck breasts, in grams. Yes, you need to. Whatever that weighs, measure out 2% of that weight in kosher or pickling salt, as well as 0.3% - that's three-tenths of a percent - in Instacure No. 2. Mix the salts, sugar and thyme together in a large bowl. Coat the goose or duck breasts in the mixture well. Massage it into the meat, and make sure every bit of it has cure on it. Put the meat into a vacuum bag, along with any stray cure. Vacuum seal this and set in the fridge. Cure in the fridge for 3 days to a week. Since this is what is called an equalization cure, you can safely cure your duck breasts for a week without worrying that they will get too salty. When you're ready, rinse off the cure and dry the breasts thoroughly. A lot of people will tell you to rinse off every smidge of cure, but I don't like this -- I like the few remaining bits of thyme here or there. But you need to get most of it off, and it is imperative that you dry the goose breasts after rinsing. Let the breasts dry on a rack, skin side down, for an hour or two. Now it's time to hang them. You will need a humid place (60-85 percent humidity) that is between 40-60°F to hang your goose prosciutto. Poke a hole in one of the skin "tails" and either run an "S" hook through it or some string, or wrap loosely in cheesecloth. Hang on a rack so it does not touch anything else for at least 2 weeks and up to two months; more if you are experienced. Note that prep time does not include curing and drying time. 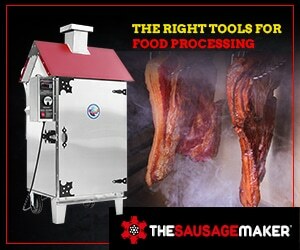 Explore the whole world of cured, salted, dried and smoked meats right here on Hunter Angler Gardener Cook! How do you control the humidity of the walkin cooler? Ash: With a device that attaches to a monitor and a humidifier. I have tried a few times now throughout the game season using a few different techniques- none of which have yealded the results I desired – I now feel I have enough now-how to make it work but the game season is over. I run a restaurant and planned to run smoked and cured duck breast throughout the spring season as part of our charcuterie plate, using duck caught in the season and cured for use through spring. Now I feel I can make it work because I understand the equalisation method but I’m wondering about using frozen goose breast will it work? Or should I just wait now until after summer, or farmed duck? (I am using your Lonzino recipe by the way and it’s fantastic from Welsh Mangalitza pork) I’m based in Kent in the U.K. will be trying the venison pastrami in summer menu too as muntjac and roe deer are available throughout the year. Morgan: yes, it will work with either frozen or farmed duck or goose. I’m doing a few duck breasts. I’m taking your advice on salt content in cure because so many others are talking about 1 cup of salt per breast. That seems silly. One thing I’ve learned is that it doesn’t always take an entire box of salt when curing in vacuum seal..but what are your thoughts please? I mean, I just made a cure from total weight of 4 breasts, 2.5% kosher and .3% Prague 2 , as you suggested. Why do other people think you need so much? Thanks always.